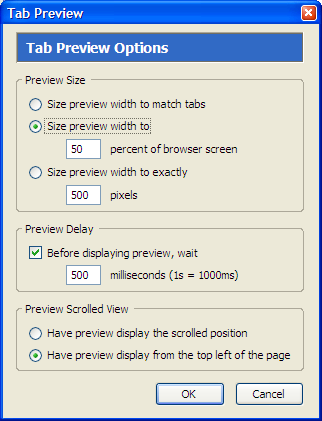 Tab Preview is an extension for Firefox 1.5 or newer that shows a preview of tab contents when you move your mouse over a background tab. It's simple to use, but surprisingly useful. Also check out the options available. Go to the Tools -> Extensions menu, click on the Tab Preview entry, and click the Options button. Tab Preview uses the drawWindow method of the HTML canvas element defined in the WHAT-WG spec. 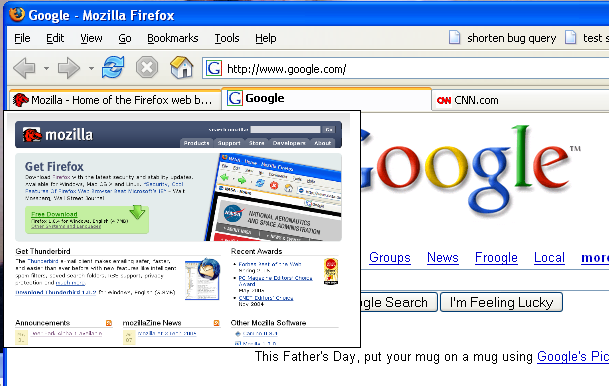 This is implemented in Firefox 1.5 or newer.